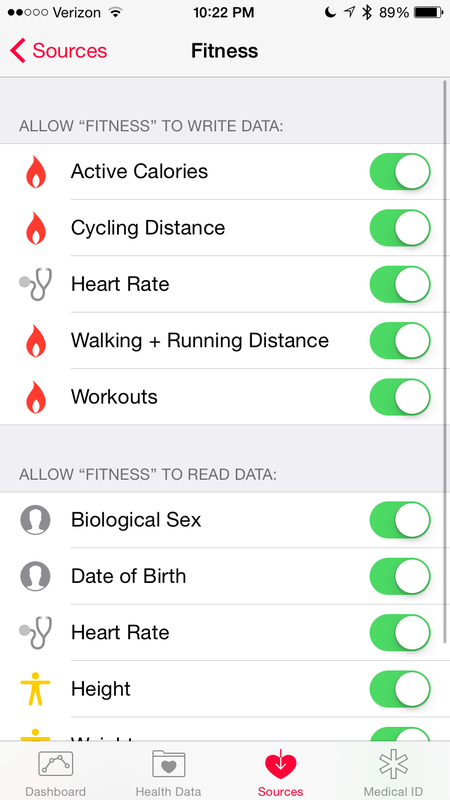 When Apple first released HealthKit my question was “can this help me?” — and now I’m happy to say, YES! However, not everybody on the playground wants to play the same game, or with the same rules. One thing Apple definitely did right is the ability for users to manually enter data points in the HealthKit app themselves, which circumvents those players who don’t want to necessarily join the game just yet. 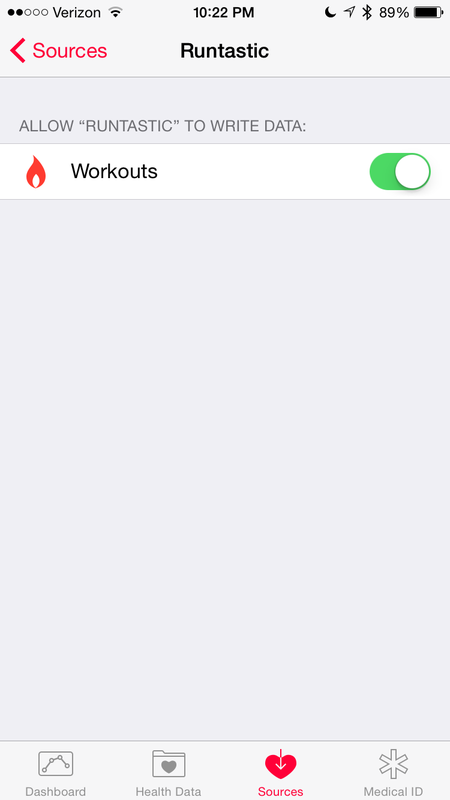 For example, Fitbit has made it clear they don’t plan to integrate with HealthKit anytime soon. However, if you’re inclined to do things the old fashion way (read: manually), you can take the weight data you saw on your Fitbit Aria and enter it yourself in the Health app. But this isn’t the point of the software, and really negates the automated experience. 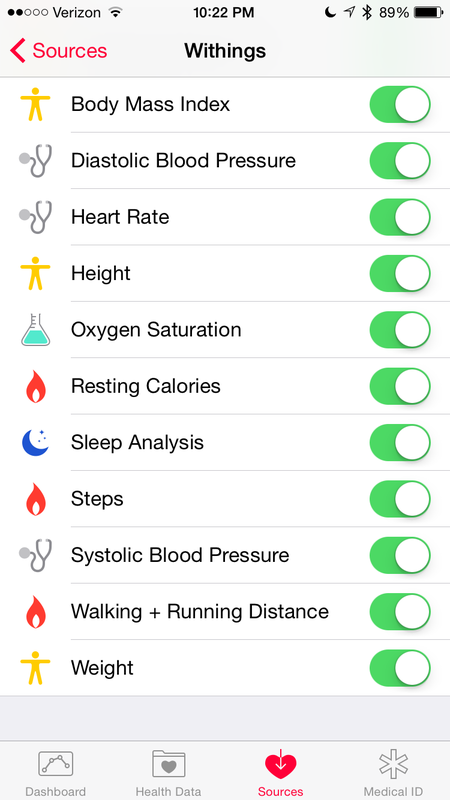 As a central hub for your measurements, the HealthKit platform is superb. It takes all of the data you have and aggregates it into unique segments, such as Body Measurements, Nutrition, and even Fitness. Some of the more interesting categories are Vitals and Results, sections that will benefit those with medical conditions. Painting the picture for the future, it seems logical that eventually the recordings you take with your phone, your Apple Watch, or other third-party device would not only sync to HealthKit, but then could push all of the collected data to your medical provider. And with this data also comes potential for wide-spread analysis of similar patients, for benefited research and future care. Sounds great, right? Overall the concept flows nicely. 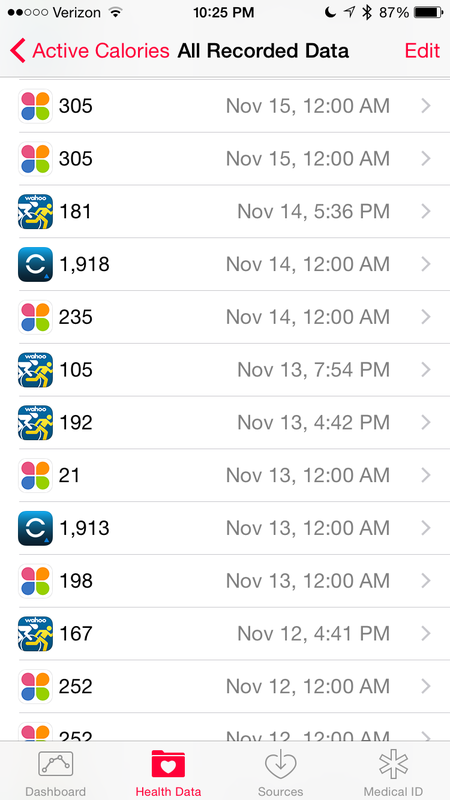 As you can see above for example, there are active calories recorded together from Withings, Garmin Connect, and Wahoo Fitness. 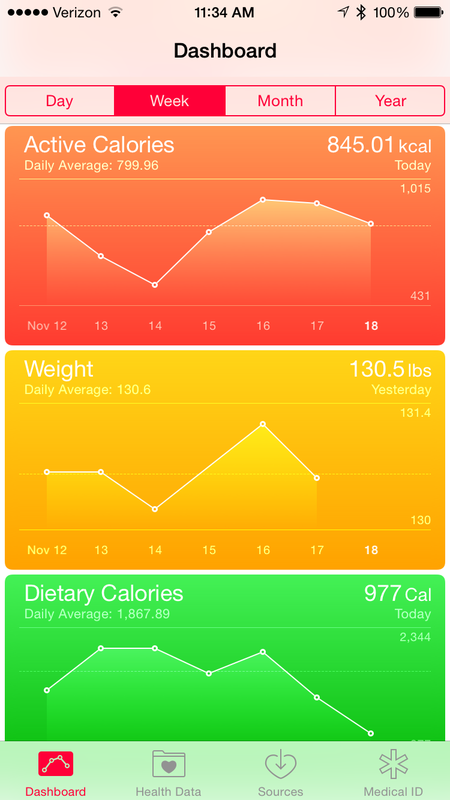 But the stumbling block here is that HealthKit does not alter this data in any way. If you use two devices to record your steps, you’ll see the total steps of BOTH of those devices, combined. This, plus the steps you may be recording with the motion processor on your newer iOS device, causes a huge false sense of activity. So beware, the tiles on the main Dashboard of your HealthKit may not be painting a very accurate picture if you have sources that contribute duplicate data. Down the road perhaps Apple will find a way to fix this issue, and they’ll have to I suspect once the step recording from their watch kicks in 2015. It will be interesting to see how they handle that. 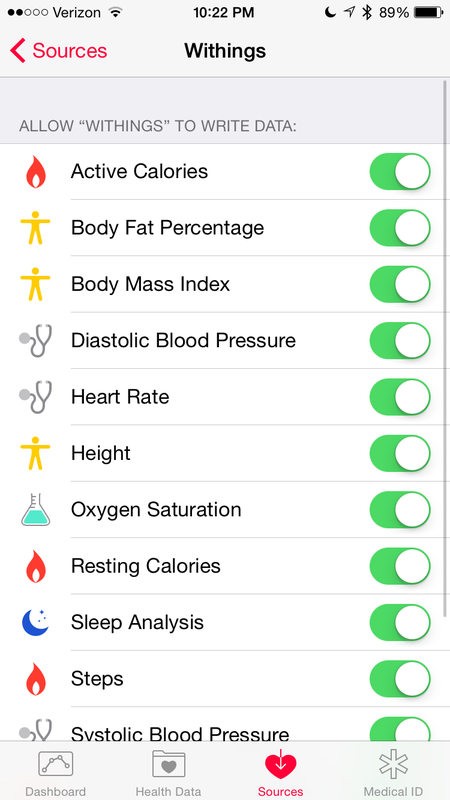 Over the past year or so I’ve played around with a huge collection of fitness apps, and just barely have begun to skim the surface of those offerings that integrate with HealthKit. I’ll briefly talk about the 10 apps that mattered most to me, as pictured above in the Sources photo. 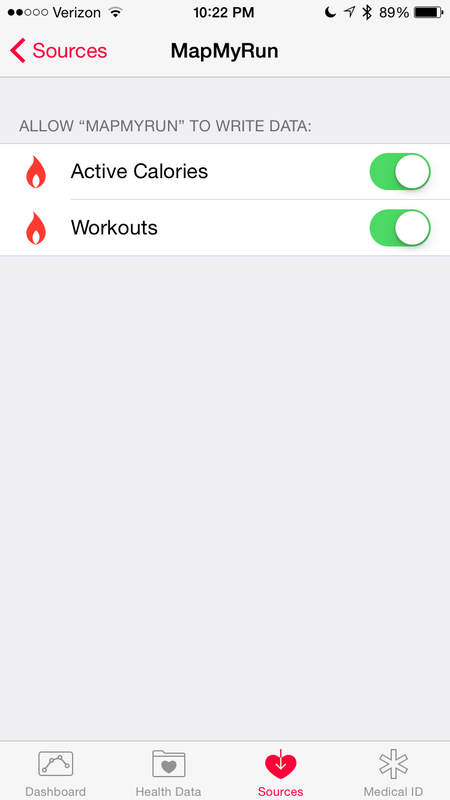 I’ll also talk about how MyFitnessPal works, and specially how it can benefit from the HealthKit party. For people keeping a tab on their caloric food intake, looking to log their nutritional breakdown, or whatever other similar task, I’m still a huge fan of MyFitnessPal for that task. 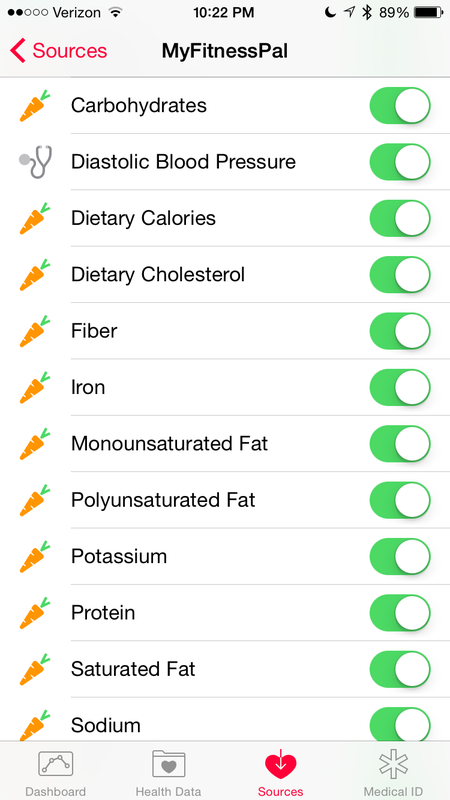 Other apps exist, like LoseIt, but MFP has won me over and will be the app I focus on here. In the past MFP has been a central hub for all of your data. It would allow you to link your activity tracker (such as a Fitbit Charge or Jawbone UP24) to keep tabs on your daily activity. It also could collect data you would push from fitness apps like RunKeeper, Strava, or the likes, for your cardio workouts. And if you had a smart scale, such a Fitbit Aria or Withings WS-30, the data from there would also end up on the MFP site if you wanted. Although it may seem like MFP had much to lose by HealthKit usurping their hub-centric offerings, the truth is that MFP has the most to gain from this change. Where they have needed to devote time and resources to their API, and were forced to solicit partners to help gain traction, they will now benefit from the fact that most everyone wants a piece of the Apple pie. And that means that MFP now has access to all the data in your HealthKit hub, with should eventually prove to be an ever broader spectrum of partners than they had before. Spend just a few minutes in the MFP community forums and you’ll come to realize that a great number of folks use the caloric data from their activity tracker and/or fitness app (running, cycling, etc) to help maintain a better view of their true daily caloric burn, and match it up to their daily caloric intake. This balance can be useful not just for weight loss, but also muscle gain, or just general fitness awareness. Over the last year my perfect MFP setup involved a Fitbit tracker and wifi smart scale to record my daily steps and weight, plus a 3rd party fitness app (which I’ll talk more about later) to record my cardiovascular workouts where I use a heart rate monitor. Pushing those workouts to the MFP hub would share that data back over to Fitbit, which was then smart enough to ignore the caloric burn for the steps at that time, as it knew to trump that data with the exercise info. Where things start to fall down typically has less to do with MFP, and more to do with that third-party app, but I’ll talk more about specific apps and their MFP/HealthKit benefits/flaws in a moment. First, let’s talk about other hubs that try to be your central focus, such as Digifit, and Argus. 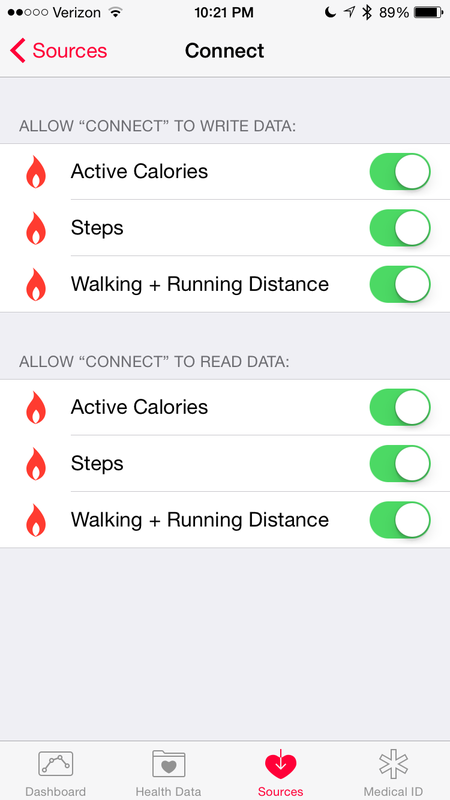 Both of these apps collect data from your activity tracker (or motion processor), plus your exercise workout data. Both can be used to record real-time workouts, too. But neither of them allow you to input your caloric intake properly, therefore lacking a good in/out calorie view that I personally find very important. Digifit was my favorite central hub for fitness for a long time, and I loved that it pulled in my data from MFP, Fitbit, and other exercise apps. I even enjoyed using it to exercise, but eventually found it didn’t have the best interface. They do offer a deep-set of insight into your workout, such as cool down periods (also known as recovery post-workout), as well as analysis of your heart rates to determine max BPM, Vo2 testing, and LTHR routines. But for the average consumer the product just isn’t clean enough to work nicely. 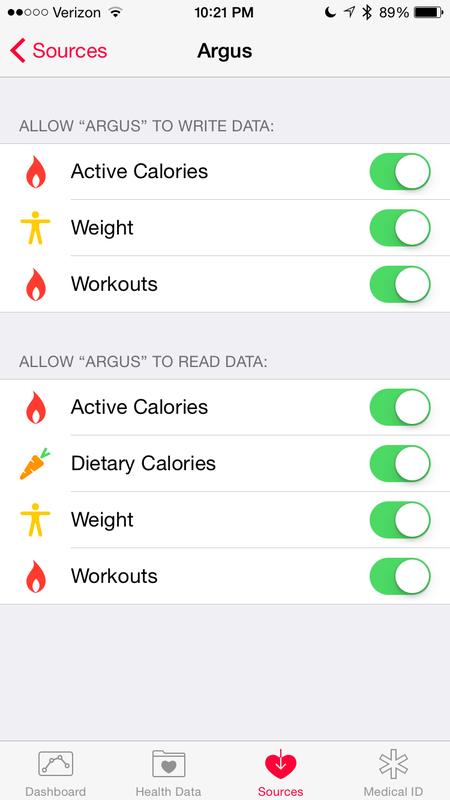 Check them out, though, as they do work with a few different trackers, both of the big calorie apps, and HealthKit. Argus on the flip side offers a more visually pleasing approach than Digit, without the nice web hub though you can export your data from their cloud. But again, while the UX might be pleasing, they try to bring in lots of data, not send it back out. 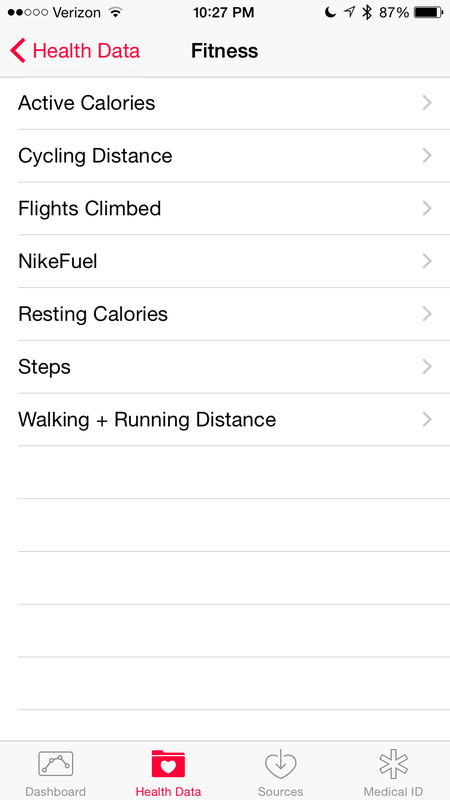 So you can see all your steps, workouts and other info on a single page. But if you want to view your fastest run, or longest bike ride, you’ll find it still is better for task-specific apps. And if you already use Withings and Run Keeper, for example, then you can just link those two together and skip using Argus anyhow. Like Digifit, I think the Argus app is interesting and has a niche, but most users will find it rather useless for their end-game. 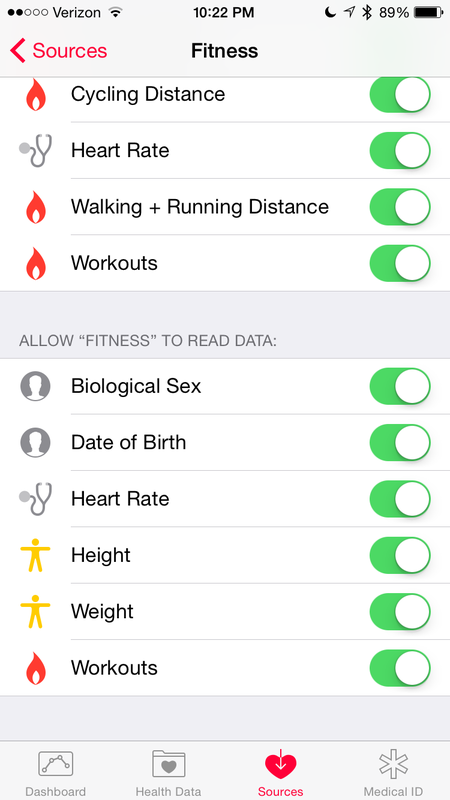 When you get right to it, there are a lot of options for getting your data into the HealthKit hub when it comes to exercise. The list is larger than my selection here, but as you can see Strava, Wahoo Fitness, MapMyRun, Garmin Connect, Polar Flow, and Runtastic can contribute to your workout history. 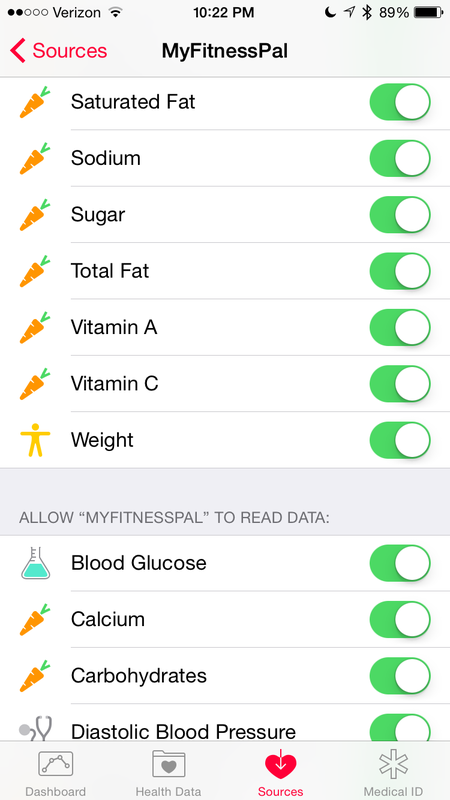 In the case of MyFitnessPal, it will pull down any of those workouts, so if you have any of those apps you simply need to share to HealthKit, and MFP will take care of the rest. 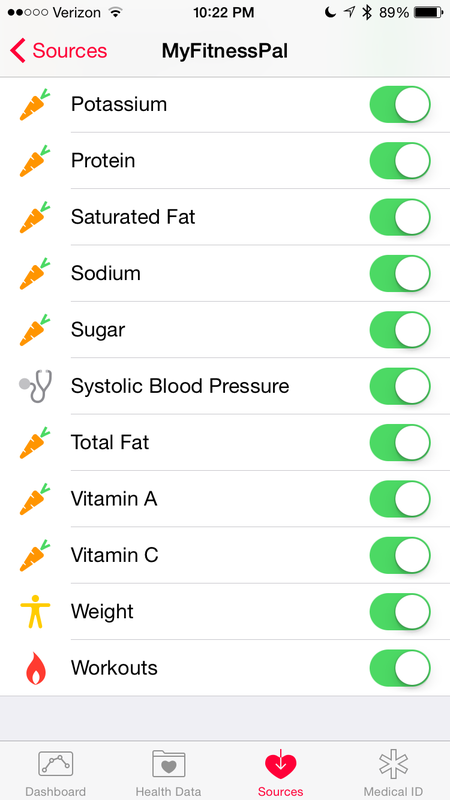 Again that is an example of how MFP will benefit as more apps provide data into the HealthKit hub. Since almost all of these apps are somehow computing your caloric burn of a workout, they rely not just on the hardware you strap to your body (heart rate monitor, cadence bike sensor, just to name a few) but also knowing your current weight, age, and other personal details. While you are unlikely to have a change in gender or date of birth, that data is still useful for these apps to pull down from the hub. Hence it would be nice to see those apps who aren’t yet pulling down the data do so such that they get the full benefit of the purpose behind the HealthKit system. 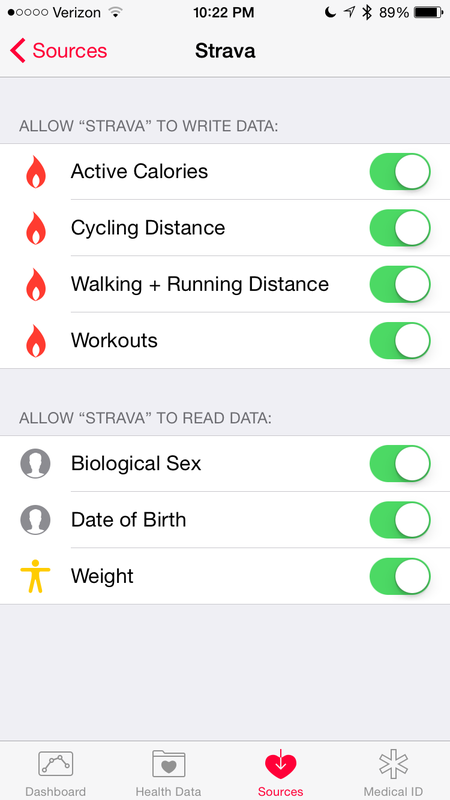 For example, if you have a Withings WS-30 you can see their app will push the data to the Apple cloud, and then Strava would pull that down into their system, updating algorithms for caloric burn accordingly. That is the beauty of the hub here, so again developers, if you’re listening, please make sure you enjoy the two-way-road that is the HealthKit platform. One prime example of poor form in this arena is Withings, who is happy to share their data with the hub, but pulls absolutely no data back in the other direction. This might seem selfless in a way, but in truth it makes the Withings system a closed one, and a poor option in many ways. Let’s say you are a MyFitnessPal user who wants your steps/activity from Withings to adjust your daily calories. So you link up Withings and MFP, great. Next, you decide to go for a cycle ride on Strava. That data eventually makes it to MFP, but by the end of the day Withings will overwrite it with the data it recorded alone. Unlike Fitbit, the Withings team feels that the activity you do outside of their recordings should not count towards your daily caloric burn. Yes it does help with the leaf pedal on the flower in their app, but it won’t help when you’re trying to eat back some portion of your exercise calories. 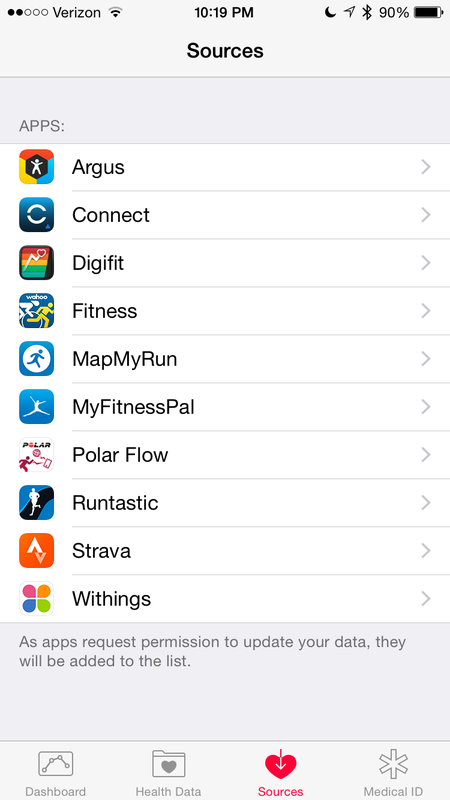 And even then, only a few apps (such as RunKeeper) even integrate on that rather limited level with Withings. I’m excited about the new Connect with Polar API that will open the door for many options there, especially after I recently tested and absolutely loved the Polar M400 fitness watch. 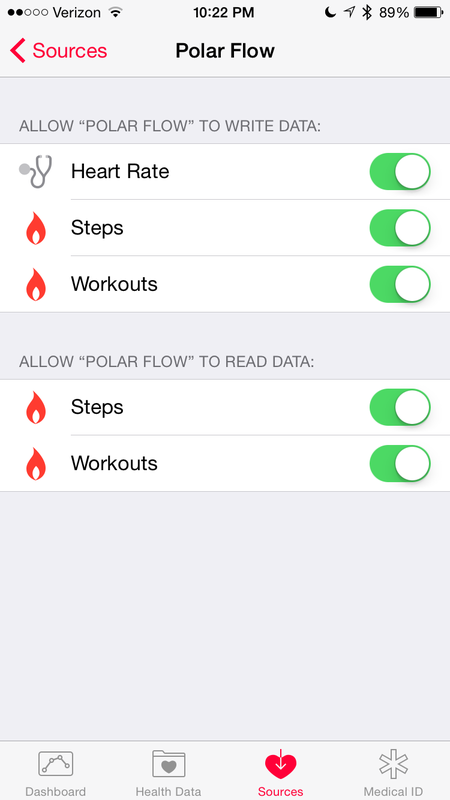 At this time there is no MyFitnessPal integration with Polar, but if you perform a cardio workout with them it does push to HealthKit and then ultimately to MFP. So while your daily steps and those calories won’t make it to MFP, the unique sessions you perform will migrate over. Polar’s big competitor, Garmin, already has MFP integration though it isn’t the most solid at times but it does the job, making the Garmin Vivosmart a great option for iOS users who want some HealthKit fun. We are enjoying the start of a wonderful evolution. Right now the options provided to us consumers to combine data from a wide range of products is better than ever. 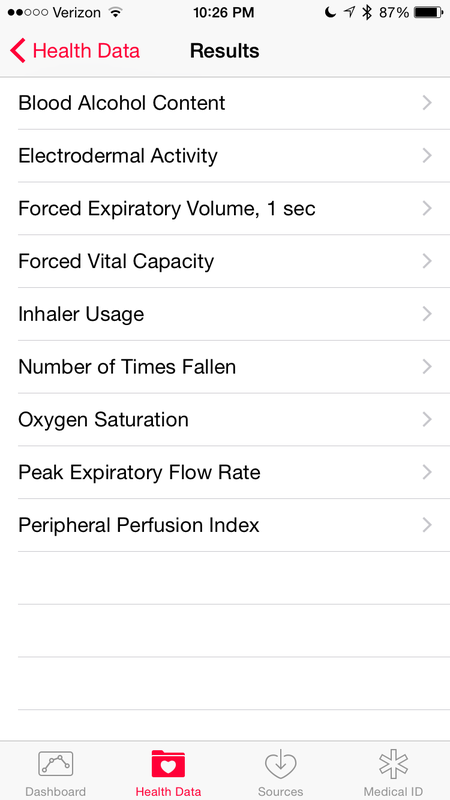 And some of that is in part to Apple’s HealthKit. Let me paint a picture for you. Imagine that you do a lot of outdoor cycling and have an ANT+ Heart rate monitor and cycle sensor. Hence you purchased a Garmin Vivosmart which can monitor your daily steps and your cycle workouts, real-time. Let’s also assume you decided to acquire a Withings WS-30 wifi smart scale to keep tabs on your weight/health. And during the off-season you workout indoors, recording those sessions on your Wahoo Fitness Kickr unit with their Wahoo app. 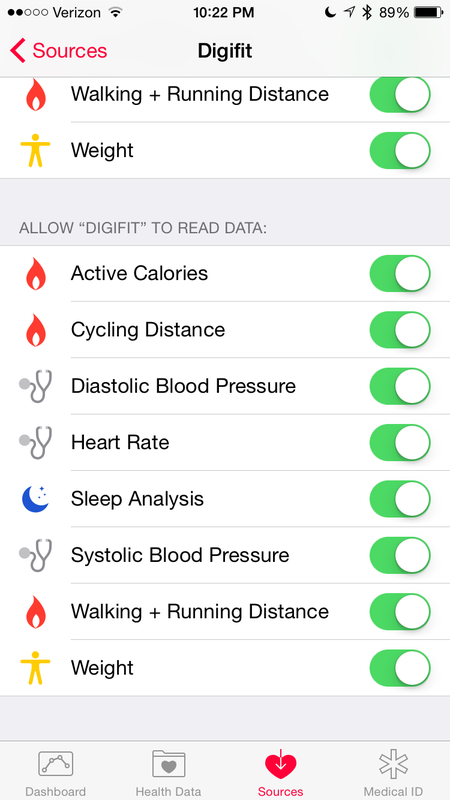 All of these apps/devices share with HealthKit, allowing you to view the data there. 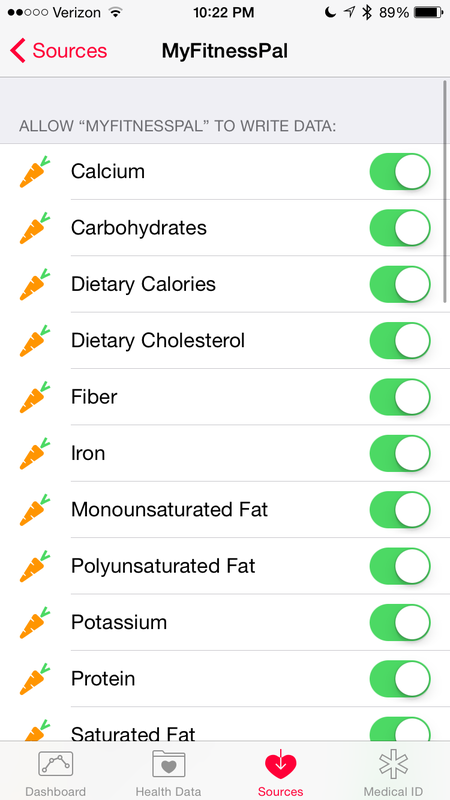 And if you so desire that same data is also accessible via HealthKit over to MyFitnessPal. Things just work, though again you’ll potentially see double-step data because your phone will add-on top of your Vivosmart. Just as Withings needs to allow third-party data in, HealthKit needs to figure out how to take data recorded by multiple platforms with the same time stamp and extrapolate from that data. Perhaps taking an average would work, or at least giving the user the right option. Again just be careful when recording activities because double-data can occur. This isn’t a problem when talking about recordings like resting heart rate, body weight, or similar. 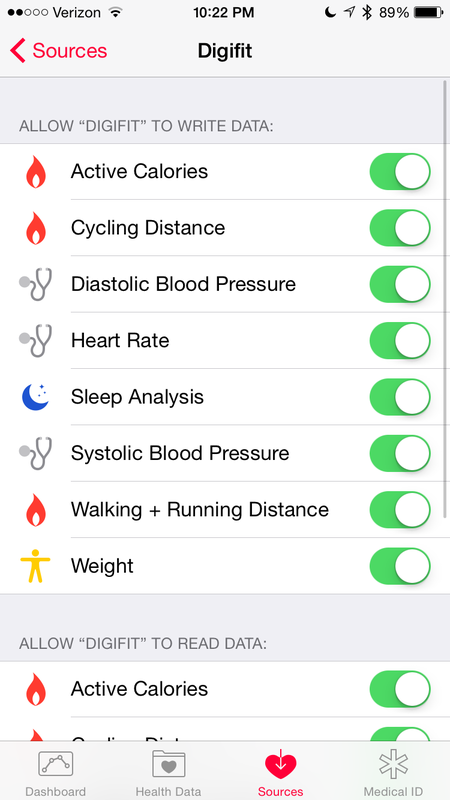 Can HealthKit make your life easier? Definitely, as long as you find apps that will share (ideally in BOTH directions) and can be utilized for whatever your personal goals may be. For me that happens to be getting MyFitnessPal to see both my daily steps and my cardio exercise, plus my body weight, and having all of that data in an easy to look at location. Right now the best place for me to view my data remains MyFitnessPal, but once Apple tweaks their system a little bit, their gorgeous, colorful Dashboard will eventually be that one-stop-shop health and fitness data hub we’re all hoping it can eventually become. Next Next post: FOLLOW-UP: Home Automation – Wink Relay & Wink Hub, Staples Connect D-Link Hub, and Lutron Caseta Smart Bridge – Plus Schlage Connect, Aeotec, Fibaro, and more!